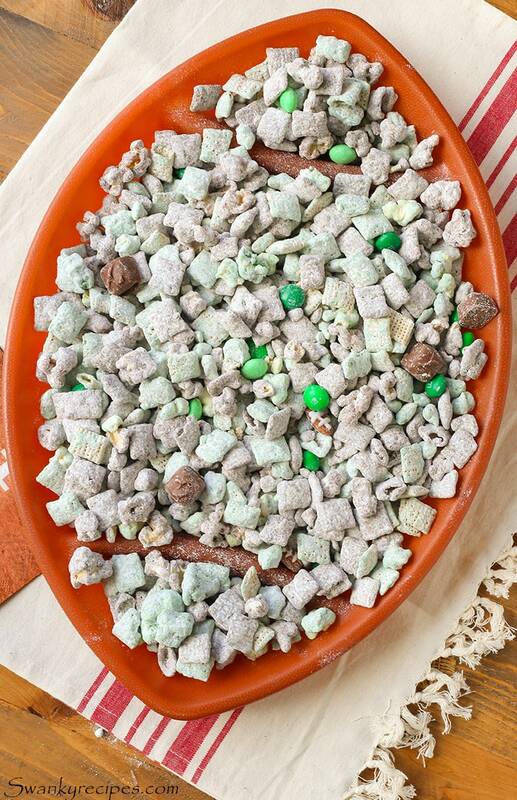 Kick off Sunday football with mint and chocolate Puppy Chow. Score one for the team and add in mini caramel milk chocolate candy pieces and mint chocolate candy coated pieces. Make this for the next game day party. I was raised on football. Watching the game on Sunday is a normal occurrence in our house. Of course, it wouldn’t be a game without football inspired snacks to munch on. Perhaps my favorite thing about this time of year is getting to spend time with friends while cheering on Green Bay. All week I’m counting down the days until football returns. During this time, I’m always storming up fun food ideas to make for our guests. What I love most about this recipe is that it’s a classic. It’s something we all grew up eating. I can still remember helping mom toss the powdered sugar and cereal mixture in bags. To make this recipe, follow the directions to pop the two regular size bags of Orville Redenbacher® Movie Theater Butter Popcorn in the microwave. Remove any un-popped kernels then equally divide the bags into two separate large mixing bowls. In one bowl, add 4 + 1/2 cups rice cereal. Add 4 + 1/2 cups rice cereal to a second bowl. By now, both bowls should have popcorn and rice cereal in them. I just love how easy it is to prepare Orville Redenbacher popcorn at home. In fact, this recipe can even be made ahead of the game. If you’re like me, you might just make it with your friends! Next, make the chocolate coatings. Start by melting semi sweet chocolate chips in a microwave safe bowl. Be sure to set it to 5 minutes and at power level four. I can’t tell you how many times I’ve burned chocolate in the microwave by forgetting to set the power level to a low digit! Burnt chocolate does not smell good, that’s for sure! Use a spatula to stir it until it’s smooth. Next, stir in the peanut butter and butter. Repeat the process in a second microwave safe bowl with green wafers. For this one, stir in mint extract, butter and peanut butter. Pour the warm chocolate into one of the two bowls. 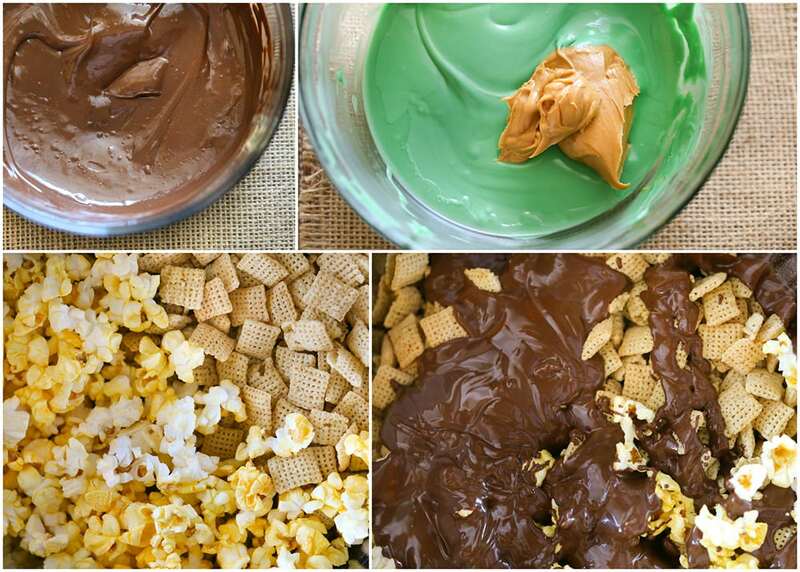 Use a spatula to evenly coat the popcorn mixture with melted chocolate. Add in cocoa powder and powdered confectioners’ sugar. Stir the mixture using a spatula until it’s evenly coated; set aside. Pour the mint chocolate spread into the second bowl of the cereal mixture. Use a spatula to evenly coat the popcorn mixture with melted chocolate. 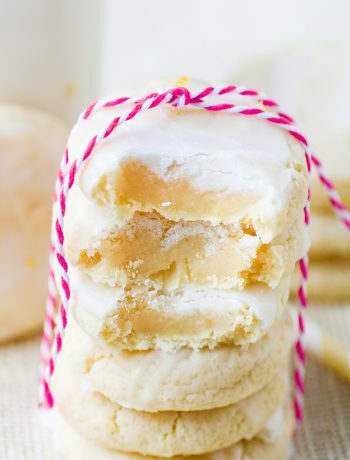 Fold in powdered confectioners’ sugar. Stir the mixture using a spatula until it’s evenly coated. 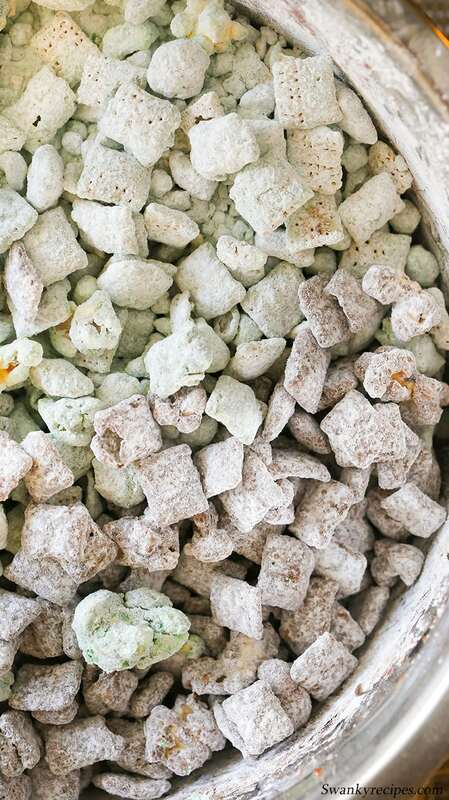 In a large bowl, combine both batches of puppy chow. Stir in 7 ounces mini caramel milk chocolate candy pieces and 1 cup mint chocolate coated candy pieces. To make the football inspired nuts, mix confectioners’ sugar and water in a small bowl. Stir mixture with a spoon to combine. Mixture will be thick! Place icing into a pipping bag with the smallest round tip available. Draw football lines on nuts. Icing will harden after a few minutes. Once it’s dry, add the football nuts to the puppy chow. 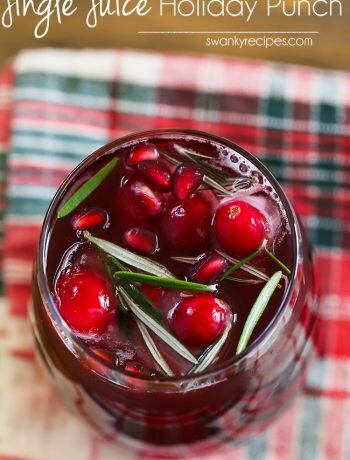 Pour mixture onto a serving platter or bowl and serve for the game. 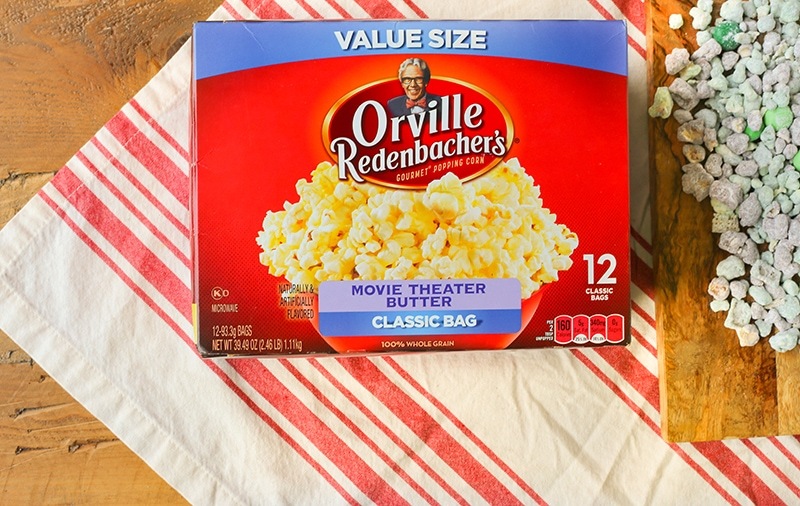 Orville Redenbacher Movie Theater Butter Popcorn is the best quality popcorn around for special parties. The buttery popcorn really take takes this recipe to the next level. 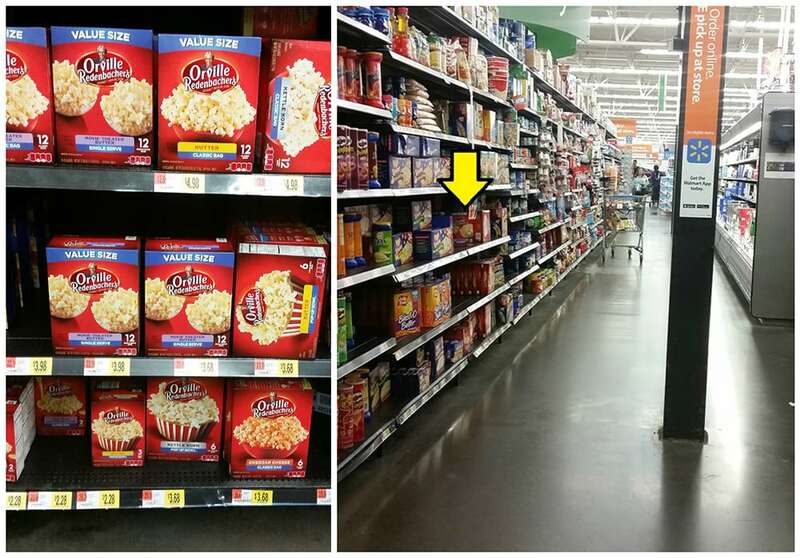 Simply head to Walmart® and be sure to look for the popcorn in the snack aisle. 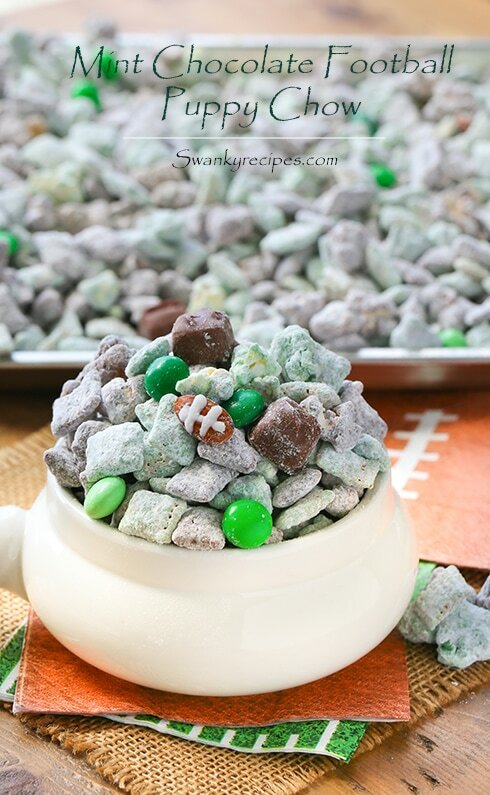 I can’t imagine football without puppy chow! Seriously, it’s everyone’s favorite childhood snack. 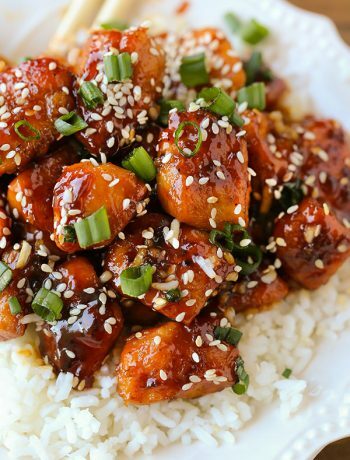 If you’re looking for a simple football inspired dish to make, try this! For more recipes and game day inspiration, head over to Orville Redenbacher. What are your favorite game day snacks featuring popcorn? 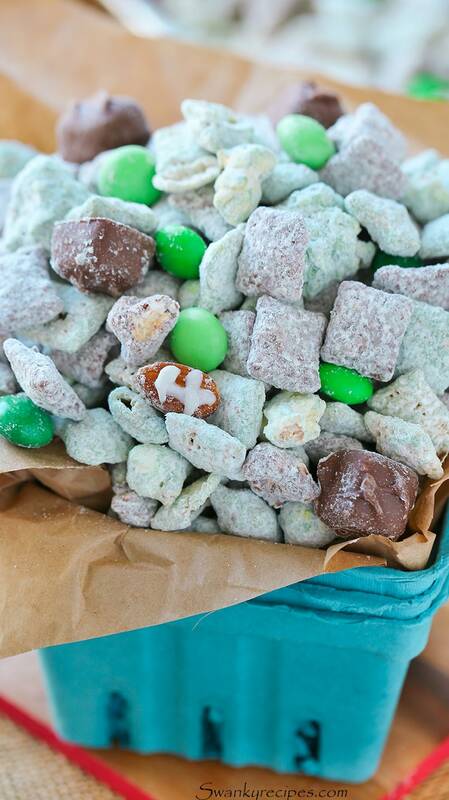 Kick off Sunday football with mint and chocolate Puppy Chow. Score one for the team and add mini caramel milk chocolate candy pieces and mint chocolate candy coated pieces. Make this for the next game day party. Follow the directions to pop the two Orville Redenbacher Movie Theater Butter Popcorn (regular size) bags in the microwave. Remove any un-popped kernels; set aside. In a microwave safe dish, microwave green wafers for 5 minutes on powder level 4. Stir to completely dissolve. Stir in butter, mint extract and peanut butter. In a large bowl, combine 1 bag popcorn and 4 + 1/2 cups rice cereal. Pour in melted green chocolate. Fold chocolate into mixture until mixed well. Add in powdered sugar and stir to coat mixture well. Set bowl aside. In a microwave safe dish, microwave semi sweet chocolate chips for 5 minutes on powder level 4. Stir to completely dissolve. Stir in butter and peanut butter. In a large bowl, combine 1 bag of popcorn and 4 + 1/2 cups rice cereal. Pour in melted chocolate. Fold chocolate into mixture until mixed well. Add in cocoa powder and powdered sugar then stir to coat mixture well. Set bowl aside. Mix both bowls of puppy chow together. Stir in 7 ounces mini caramel milk chocolate candy pieces and 1 cup mint chocolate coated candy pieces. Mix confectioners' sugar and water in a small bowl. Stir to combine. Place into pipping bag with the smallest round tip available. Draw football lines on almonds. Add to puppy chow bowl. Pour mixture into a serving bowl and serve. 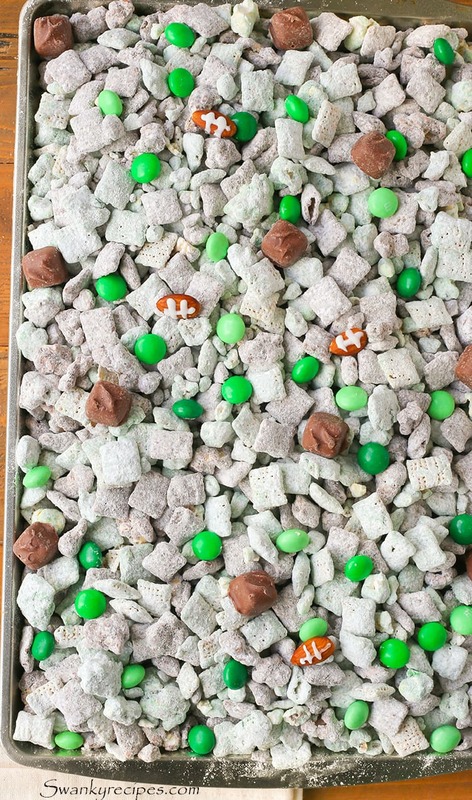 This puppy chow looks totally addictive and I know my football fans would love it. Those footballs are adorable! I’d win mom of the year for making these for my kids. I love chocolate and mint together! What a great combo- these look awesome! This may seem unbelievable, but I’ve never had, nor heard of puppy chow until I started food blogging. Maybe it’s because I don’t watch football, nor does hubby. But, I do love all the ingredients in your puppy chow and I want to make it! Stat! The chocolate and mint together looks perfect, i just loved it. 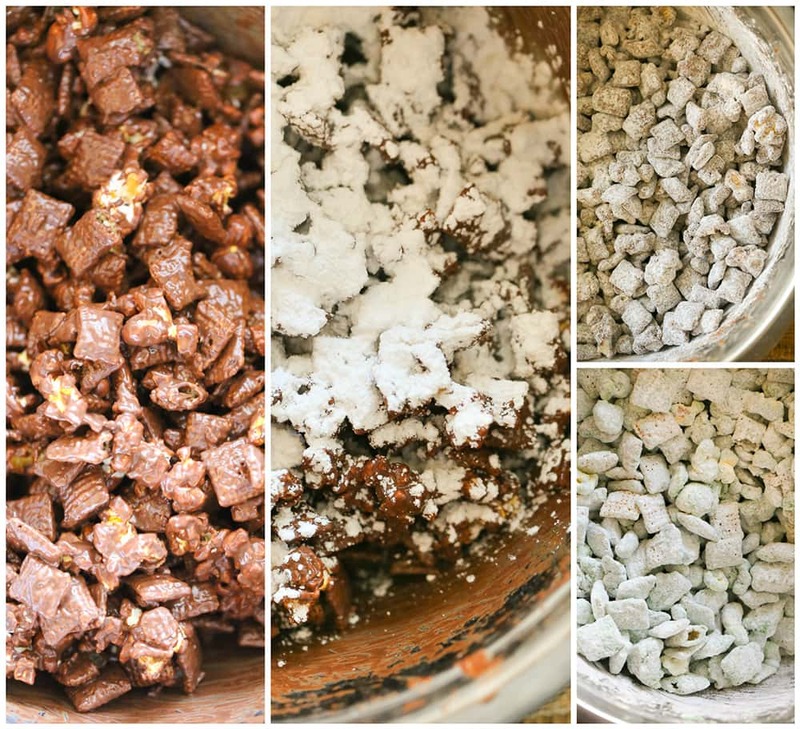 I never had Puppy Chow and I think I am seriously going to try this recipe! What are the mint chocolate wafers you used? Hi Pam, green chocolate wafers were used. I believe I used Wilton. Also, I added mint extract to the melted chocolate.